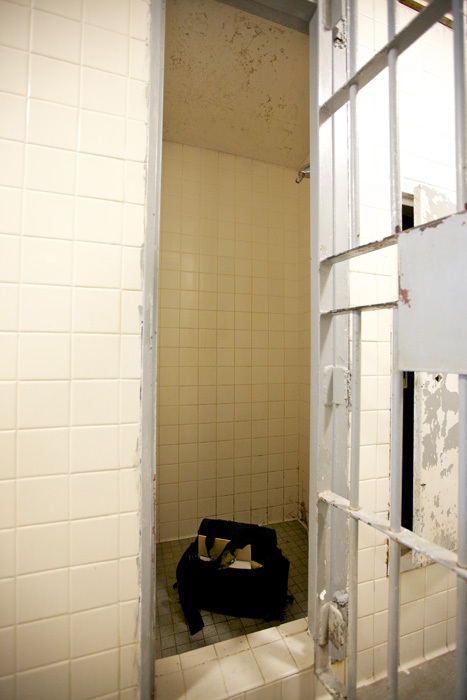 Shower stalls were used in lieu of a crisis intervention cell when there were no cells available. They also used interview booths, recreation shakedown areas and actual holding cells, none of which were suicide resistant and most of which had no bathrooms in them. The camera bag in the bottom of the stall shows its size. The only way to flush the result of staying in here too long was to get the guards to turn on the water so as to wash it down - if one could get their attention. Stays in here lasted anywhere from a few hours to a few days. Prison personnel say the practice has been discontinued. This is a typical 2 person cell. Note the toilet by the bunk bed and the table and chairs. 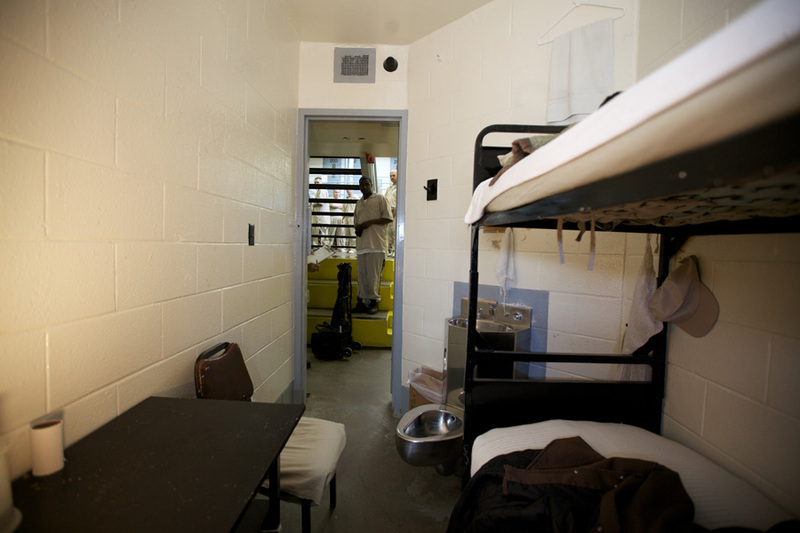 The two person cell is one in which a mentally ill inmate would be housed. 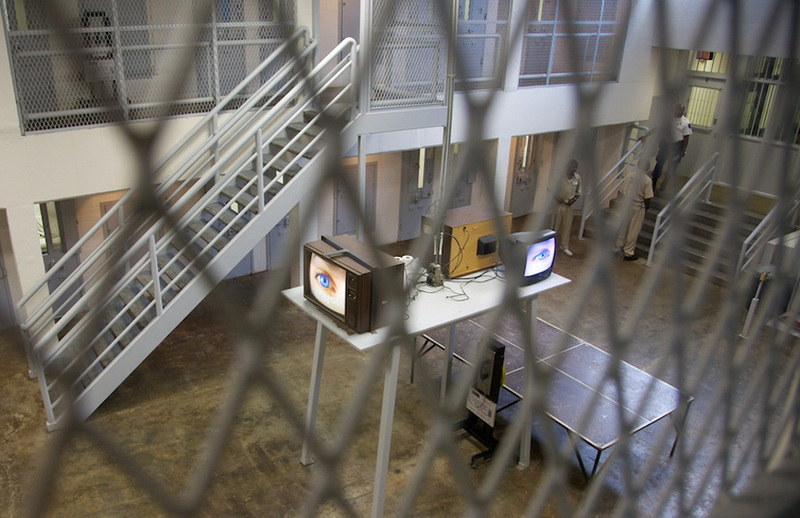 Some mentally ill inmates are in the general population while others who are chronically or acutely ill are housed in a special program called the Intermediate Care Services (or "ICS") or Gilliam Psychiatric Hospital (or "GPH"). taken at GPH, which houses only inmates in need of acute psychiatric care. Mentally ill prisoners are subject to the harsher conditions of segregation when they either break the rules and are found guilty of a disciplinary infraction or when they are having a mental health crisis and rather than being sent to GPH, they are put on crisis intervention (or "CI"). Their disciplinary detention sentence can run from days to years depending on the severity of the infraction and the number of times they commit the same infraction. Some report as many as 7 consecutive years in segregation.